We are bread lovers. From our daily loaf of sourdough to the stuffed picnic bread we make on special occasions and everything in between. 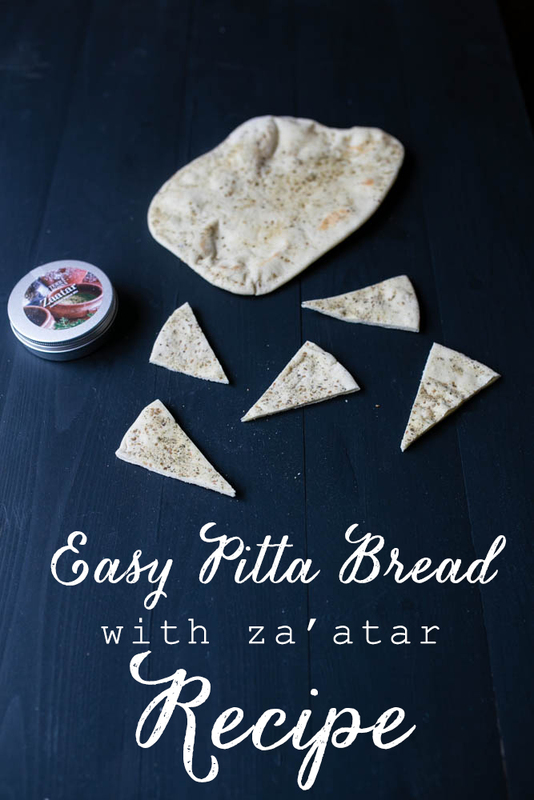 I first made flat breads after my friend Joslyn shared her recipe a few years ago along with the instruction to roll the bread out on a board scattered with za’atar. Not only did she awaken my interest in flat breads but she also hooked me up with my first bag of za’atar. Za’atar is an amazing herb and spice mix used across the Middle East. While the mix varies depending on who is mixing it you will normally find thyme, sumac and sesame seeds along with other spices. It is great in a whole range of dishes not least as a topping for pitta. I tend to make pitta when we are eating falafel and we have time to spare on the preparation side or conversely when we have run out of bread for lunch boxes and we need some quickly. It’s all about perspective! Lately we’ve been having turkey burgers in hot pitta pockets – let me know if you’d like the recipe! I was recently sent a pot of za’atar and a selection of flavoured oils by Terra Rossa who specialise in Arabian foods. 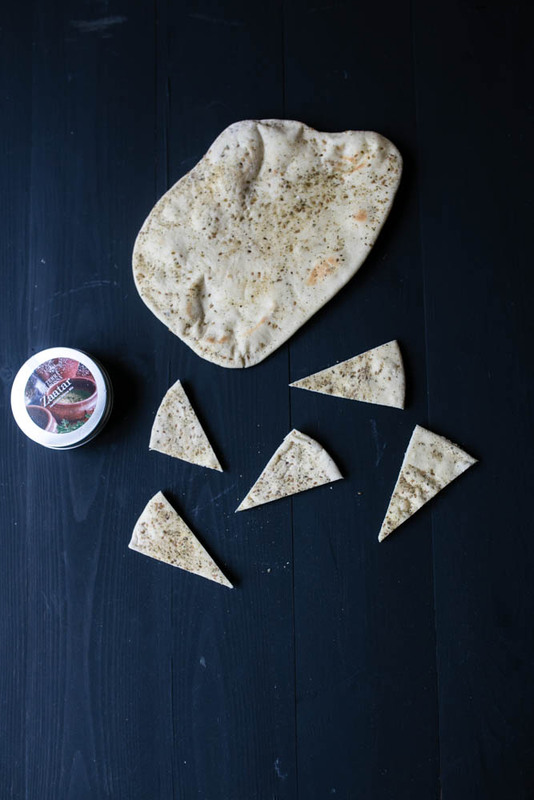 As soon as I saw it I knew that they would go really well together so I made a simple dinner party starter of za’atar rolled pitta and added the oils for dipping. Really easy and delicious. Mix the yeast into the water with a fork and set aside until it froths up a little. Put the dry ingredients, flour and salt, into a large mixing bowl then add the yeast mixture and olive oil. Bring the mixture together with a fork or your fingers and when it forms a dough knead it together until you have a silky dough. Put it back in the bowl and leave it to prove for half an hour to forty five minutes depending on the air temperature. Once it has risen divide the dough into ten equal balls. 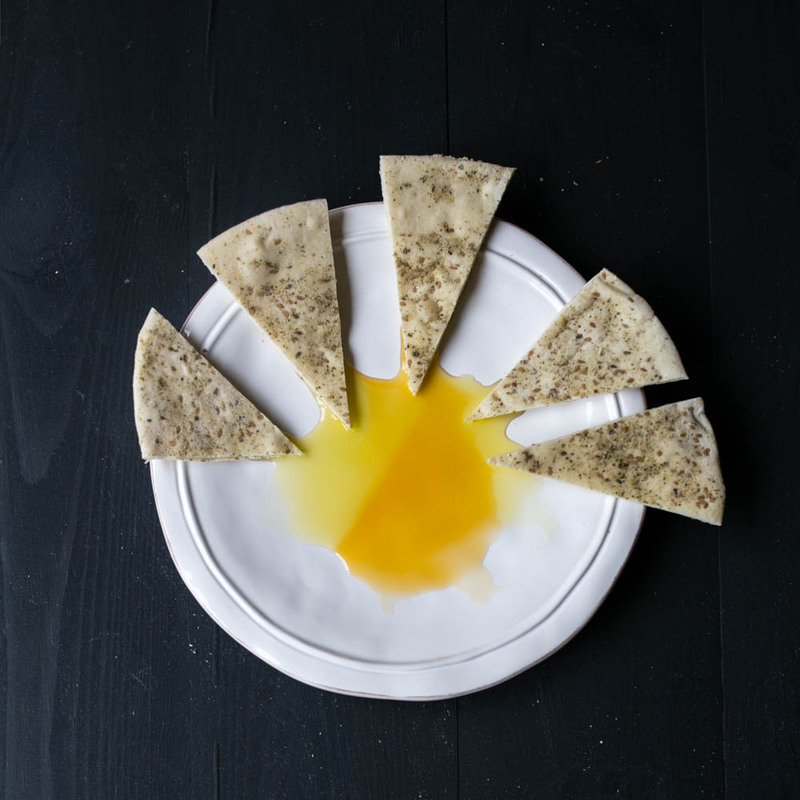 Flour your work surface and cover a side plate with the za’atar. Roll each ball lightly in the za’atar before rolling out flat. I tend to cook each pitta once it’s rolled to keep things moving along. Heat your largest frying or griddle pan over a medium flame. Lay your rolled out dough in the pan and allow to cook for a minute or two – little blisters will appear on the surface. Flip it over and cook for 30 seconds to a minute before flipping it back to the original side. At this point your pitta should puff up with air (this is totally my favourite bit). Whip the pitta off the heat and lay on a wooden board. To make life easier I often run a knife into them at this point if I’m going to use them as pitta pockets.